This was for an article in the Metropolitan magazine. I knew nothing about the story or the person nor had I ever met the writer. The pictures were taken in the summer but the article did not appear till October. 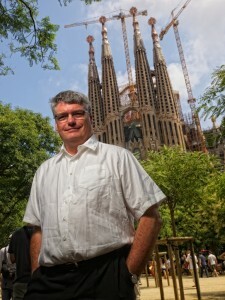 I am not a big fan of the Sagrada Familia, to tell the truth, I find it kind of monstrous, a case where Gaudí had decided ‘less was definitely more’, also the neighbourhood is not one of my favourites, it has that transitory feeling of areas around train or bus stations, and a little sordid perhaps. And of course the multitude of tourists can be claustrophobic, especially if you are trying to work. Because the writer was there I did not have much time so decided on using the park in front and used a brolly on a flash and did the whole thing in about 5 mins. I quite like the wonky angle and I like the post production that brings out all the texture, even in his shirt! After I had finished with him I toyed with fleeing this hell-hole but decided I should get some shots of the place. At first I thought it would be best to get pics without the crowds, then I realised ‘no, why bother?’ The crowds are all part of the dubious experience, as was almost getting run over by a coach driver who was obviously enjoying the whole experience as about as much as I was.